Whether it’s the holidays, a family reunion or a gathering of friends, there are occasions that call for more than a quiet corner table. Fortunately, there are restaurants throughout Los Angeles that offer options for shared plates and family-style menus from around the world. 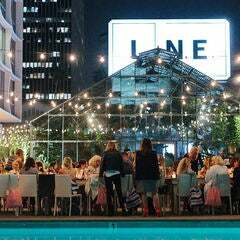 Read on for some of the best restaurants in L.A. to dine out with friends and family. The Mediterranean-inspired Cleo originally opened in Hollywood and now has a location in the Orlando Hotel on 3rd Street. Cleo smokes up some of the finest vegetable dishes in the city, but it’s not an exclusively vegetarian affair. Their roast lamb, served on a bed of couscous with Lebanese yogurt, is a carnivore’s delight, as well as meatball tagine, bone marrow with oxtail, and spicy "cigars." 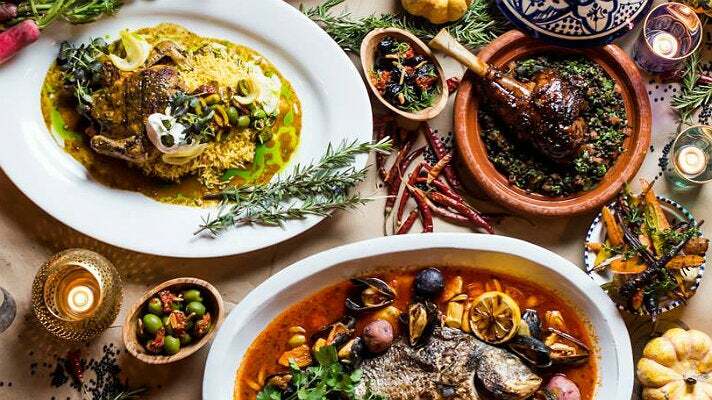 Other standouts include bastilla - a Moroccan pastry crust stuffed with glazed duck, crispy Brussels sprouts, and oven-fired flatbreads with various toppings. 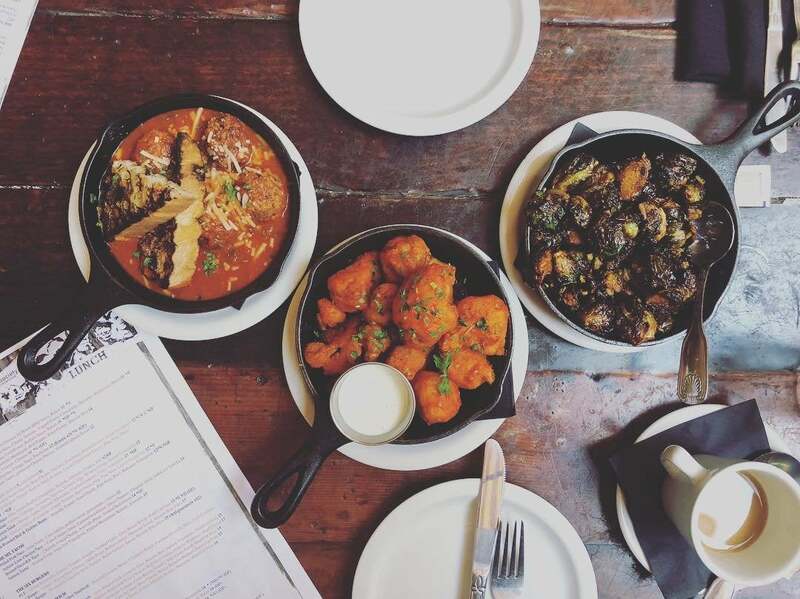 Small plates and communal tables make Cleo an ideal shared dining experience. Add craft cocktails and a lengthy list of French wines and champagnes, and your meal is sure to be as lively as it is delicious. NOTE: Cleo Hollywood is currently closed for renovations until Fall 2018. 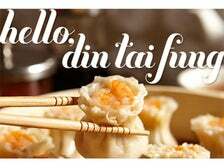 After Rick Caruso, developer of The Americana at Brand, first tasted the famed dumplings of Din Tai Fung, he was determined to bring a location to the Glendale shopping mecca. 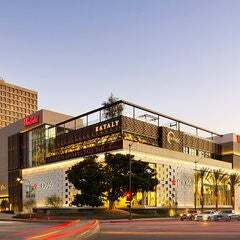 His vision was realized five years later in October 2013, when the global chain opened Din Tai Fung next to Nordstrom. 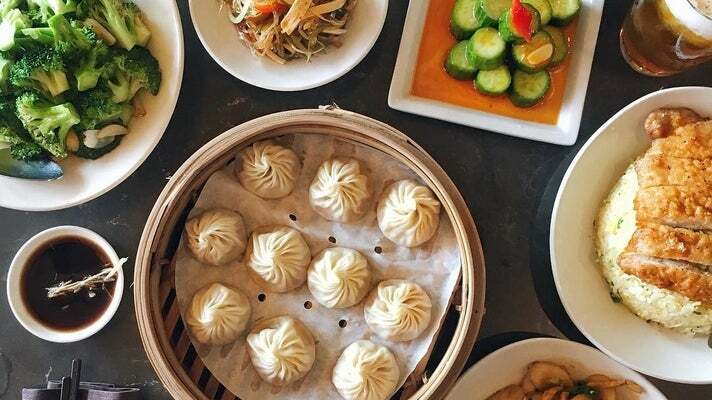 The sleek, 160-seat space is accented with elegant granite and teak, and features a showcase dumpling making station where you can watch the skilled dumpling makers craft the iconic xiao long bao at a rapid clip. 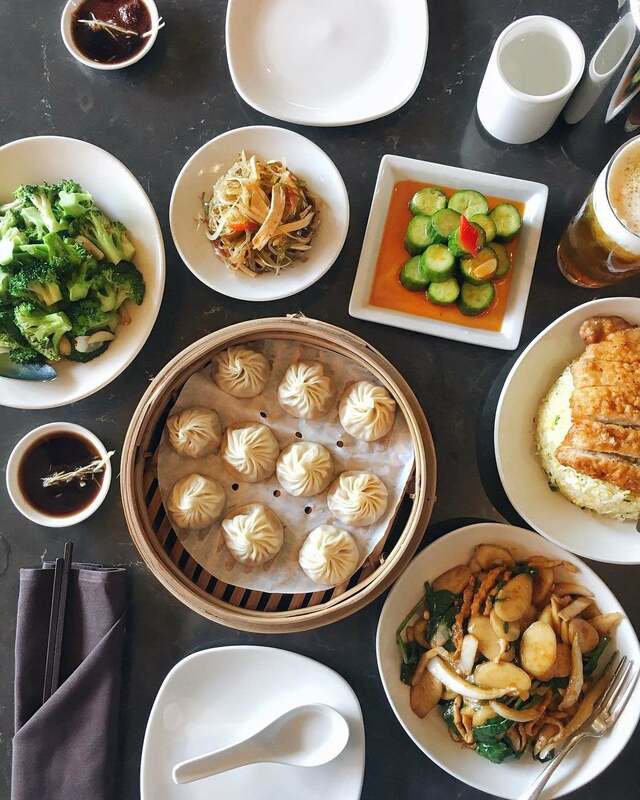 Order as you would at Din Tai Fung locations around the world, by checking off items like the juicy pork dumplings, shrimp shao mai, and pork chops over fried rice. The Glendale location boasts luxurious truffle dumplings and a full bar that features Asian-inspired cocktails. The focus at Fogo de Chão is churrasco, the Brazilian art of roasting meats over an open fire. Fogo de Chão is one of the most popular restaurants on the famed Restaurant Row along La Cienega. In February 2015, Fogo de Chão opened a sleek, 8,000 square-foot location in Downtown L.A. 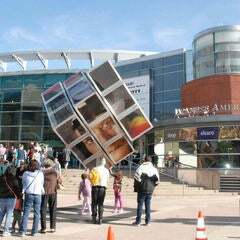 The dining ritual at both locations centers on the carvers, who are signaled with a double-sided disc. The green side tells them to keep delivering a selection of meats that are carved tableside. Options include the signature picanha (a prime cut of top sirloin), leg of lamb, pork loin and chicken. The red side tells the carvers to stand by until you’re ready for more. The Market Table features fresh seasonal salads, vegetables, imported cheeses and cured meats. Brazilian side dishes such as pão de queijo (traditional Brazilian cheese bread), crispy polenta, garlic mashed potatoes and caramelized bananas are served tableside. The Downtown L.A. location offers a light lunch option, featuring unlimited trips to the Market Table and the option to add a single protein. With a pizza-making tradition that goes back more than 100 years, it doesn’t get more authentic than Grimaldi’s Pizzeria in El Segundo. The Brooklyn-based chain is famous for its coal-fired brick oven pies; among the legions of fans was Frank Sinatra, who reportedly had Grimaldi’s pizzas flown out to him when he performed in Las Vegas. 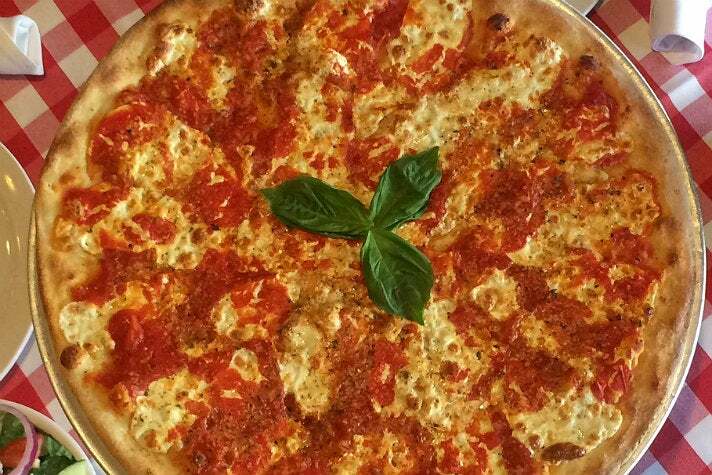 Grimaldi’s touts their brick ovens as the key to crisp pizza crusts and perfectly baked calzones. 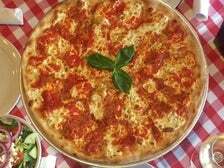 The award-winning pizzeria also features fresh ingredients, handmade mozzarella, “secret recipe” dough and house pizza sauce in its signature creations. While personal-sized pizzas are available, the best option is to go all in with friends for the full Grimaldi’s experience. Options include the Brooklyn Bridge (oven-roasted red peppers, creamy ricotta cheese, hand-pinched Italian sausage), Quattro Formaggi (mozzarella, asiago, parmesan, pecorino romano, gorgonzola) and The Don, their traditional pizza topped with Italian sausage, meatballs and pepperoni. Whether it’s breakfast, lunch or dinner, the James Beard Award-winning Guelaguetza serves some of the best Oaxacan cuisine in the country. Located on Olympic Boulevard in Koreatown, the expansive restaurant features a family style section on its menu with dishes that serve two to six diners. One of the most popular items is the Festival de Moles, a $22 tasting plate with black mole, red mole, estofado and coloradito that’s served with sliced chicken breast, a side of rice and hand-made tortilla. 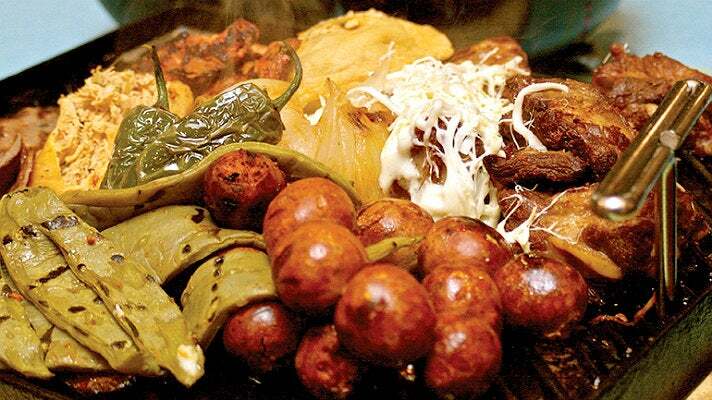 Another crowd pleaser is the Botana Oaxaquena - for $77, six people can dive into a platter laden with eight memelas, Oaxacan string cheese, chorizo, tasajo and cecina, a fresh stuffed chile with picadillo, fried pork ribs, guacamole and beans. Meaning "horn of the bull" in Japanese, Gyu-Kaku showcases authentic Japanese yakiniku (barbecue), where guests share premium cooked meats over a flaming charcoal grill while sipping on sake, shochu and frosty beers. The global chain numbers 650 locations around the world; the first U.S. location opened on Pico Boulevard in West L.A. in 2001. 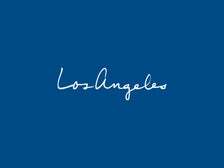 Other L.A. locations include Beverly Hills, Sherman Oaks and Pasadena. The fun, interactive group dining experience lets diners do their own cooking (with expert assistance from helpful servers) on personal grills with “smokeless” roasters - downdraft systems ensure you don’t smell like the charcoal you’re cooking with. Gyu-Kaku offers a wide range of meats, including the bestselling miso-marinated harami (skirt steak) and kalbi (short rib) in tare marinade. 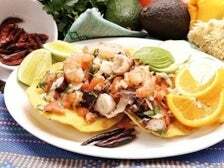 Other popular items include pork, lamb, duck, chicken, garlic shrimp and a variety of vegetables. 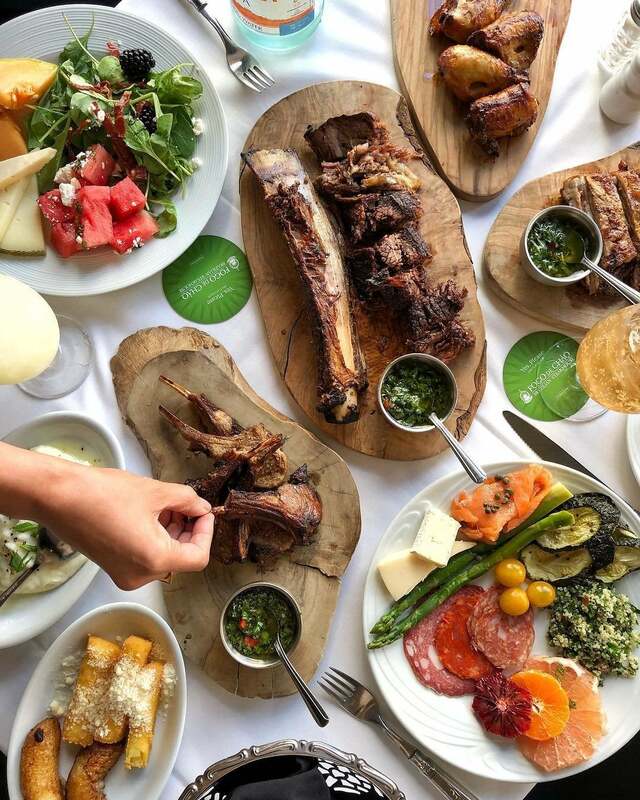 With locations in Toluca Lake and Pasadena, Malbec Argentinean Cuisine showcases signature grilled meats and the award-winning Argentine wine that gives the restaurants their names. The Malbec salad is a meal in itself, with hearts of romaine, radicchio, frisée, goat cheese, avocado, cucumber, crostini and special house dressing. 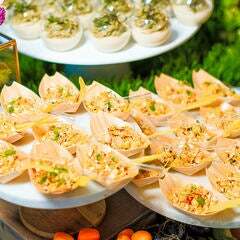 Appetizers include a choice of two empanadas, grilled veal sweetbreads, and the Costa Patagonia - flat-grilled shrimp and scallops, calamari and a Spanish pimentón-garlic sauce. 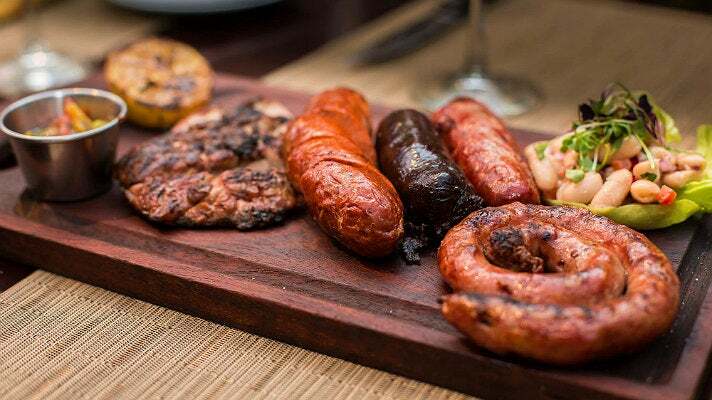 The famous Argentinean Sausage Platter offers a selection of Argentinean chorizo, Spanish chorizo, morcilla, Argentinean sausage, cannellini bean salad and criolla rustica. Malbec proudly notes that their steaks are all-natural, hormone-free and wet-aged for 21 days. Choice cuts include a 14-ounce ribeye or New York steak, or the Tabla Mixta, which features two or more cuts that are sliced on a skillet and served family style. All steaks are served with the house Chimichurri Moderno, made with hot pepper, oregano, parsley, tomato, mint, shallots, cilantro and garlic. 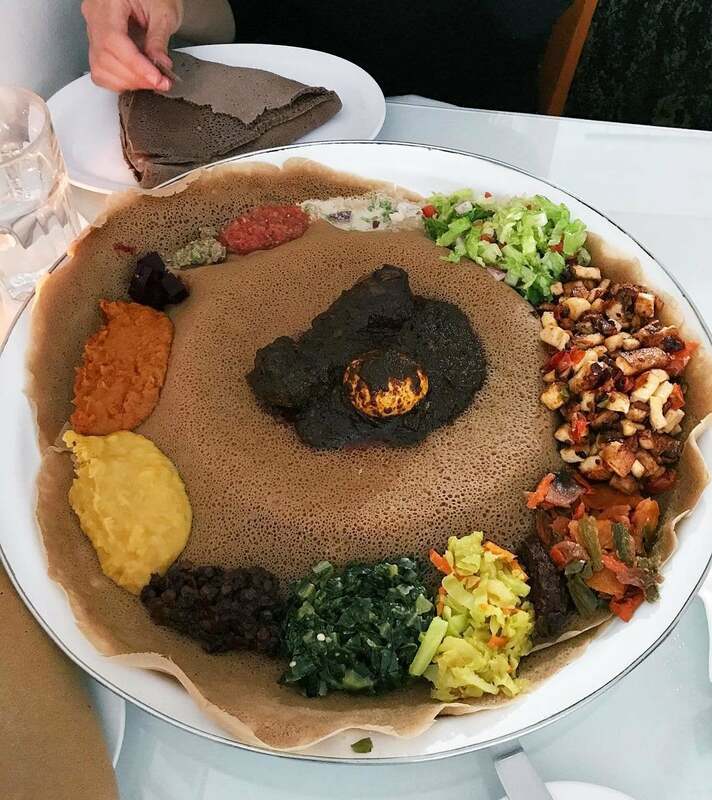 Like her neighbors on Fairfax Avenue, Genet Agonafer hails from Ethiopia, but at her namesake restaurant she’s taken her dining experience in a more contemporary direction, complete with white walls lined with Ethiopian paintings and wood silhouettes. However, you can still get your hands dirty with friends and family. 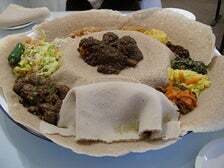 Tear off pieces of the sour teff sponge bread called injera and snag pieces of Yebere Siga Tibs (spicy sautéed beef), Hirutye’s Yebegsiga Alitcha (stewed lamb) or one of the distinct piles that form the Vegetarian Combination platter. Of course no meal is complete without a bottle of sweet Ethiopian honey wine. Propelled by the tagline, “An Education in the Art of Food & Beer,” Public School is a collective of chef-driven gastropubs that serves craft beers and eclectic seasonal menus with fresh, locally sourced ingredients. In June 2013, Public School 805 opened at The Promenade at Westlake in Thousand Oaks, joining its siblings in Downtown L.A. and Culver City. Public School’s unique naming convention adds the area code to each spot; hence the Downtown location is known as Public School 213 and Culver City is Public School 310. Shareable plates include the popular bacon cheddar tots with Sriracha ketchup, chorizo mac & cheese, speck and eggs, and "The Cutting Board," the chef's selection of cured meats and artisan cheeses. Another must-try is the Colorado lamb burger, made with tomato cranberry jam, arugula and brie on a brioche bun. “Recess” (aka Happy Hour) is held Monday through Friday and boasts items like parmesan truffle fries, crispy ahi tuna tacos and PB&J Sliders. Pair these favorites with rotating beers on tap as well as an in-depth menu of craft cocktails and curated wines. Koreatown is one of L.A.’s most exciting districts, teeming with dining and nightlife destinations. 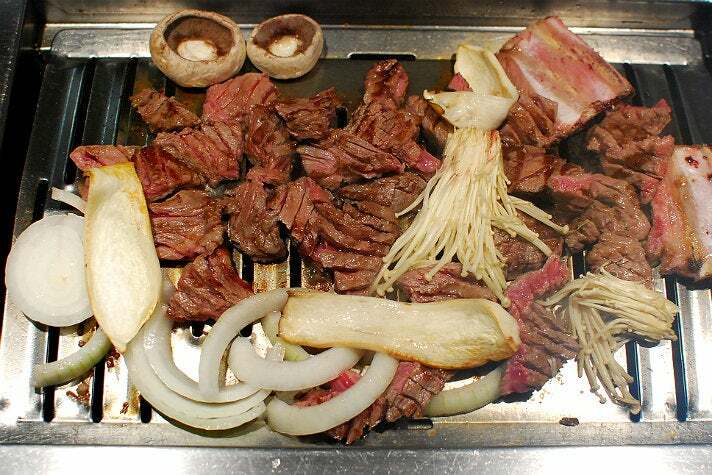 Korean barbecue is a staple of the area, and Park’s BBQ is one of the best KBBQ restaurants in the country. 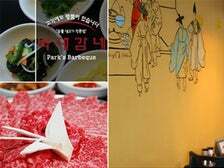 Opened in 2003 by Jenee Kim, Park’s BBQ raised the bar for Koreatown restaurants and has been at the forefront of Korean barbecue restaurants in America ever since. Renowned for its high quality and unrivaled selection of meats, Park’s BBQ offers its galbi (short rib) marinated or undressed. Enjoy the tender prime beef wrapped in lettuce with fermented bean paste, raw garlic and jalapeños. Founded in 1965 in New Orleans by Ruth Fertel, Ruth’s Chris Steak House has expanded to more than 140 restaurants across the country and several international locations, including Hong Kong, Shanghai, Tokyo and Cancun, Mexico. 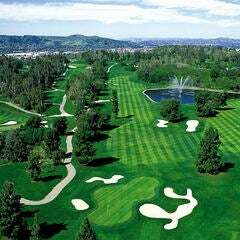 Los Angeles locations include Beverly Hills, Marina del Rey, Pasadena and Woodland Hills. The upscale restaurants are renowned for serving their steaks on 500-degree sizzling plates, the optimal way to enjoy signature cuts like the tender filet, classic T-bone, the huge bone-in Cowboy Ribeye, and the famed Porterhouse for Two. Non-beef options include Caribbean lobster tail, oven-roasted free range double chicken breast, and a daily market fresh seafood selection. The Six is named for the The Society of Six, an influential community of six Northern California artists during the 1920s Prohibition era. At their cabin, known as “The Chow House,” these artists created art with their home-made meals, brews and wines. With The Society of Six as its inspiration and locations including West L.A. and Studio City, The Six offers hearty gastropub fare in a rustic, sustainably designed interior. Dishes are made with locally sourced ingredients and served in classic cast iron skillets and rustic wood planks. The menu centers on the concept of “six” - guests choose from six starters, six savory entrees, six red wines, six white wines, six brews on tap and six desserts. 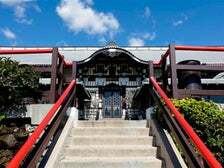 From its perch above Hollywood Boulevard, boasting panoramic city views, stunning architecture and tranquil gardens, Yamashiro has welcomed guests to its spectacular hilltop setting for generations. Perfect for groups, the Mountain Palace Sampler Platter includes banana leaf pork spring rolls, vegetarian spring rolls, Thai peanut hummus, honey baked chicken wings, and shrimp dumplings. 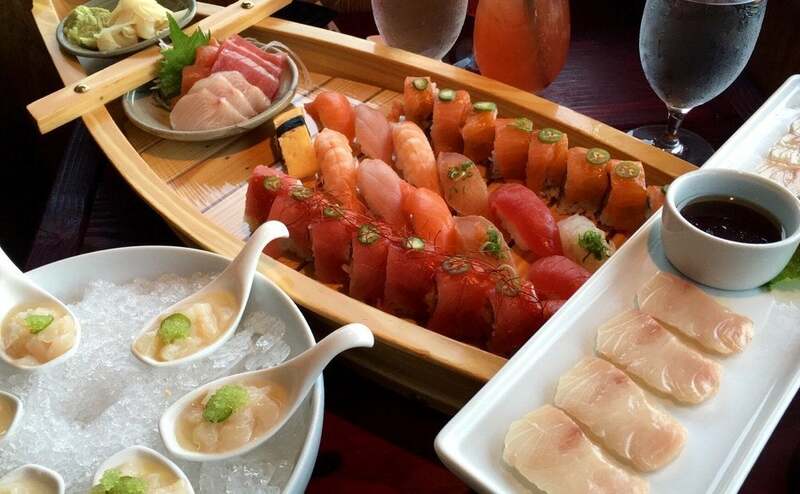 Sushi Boats feature chef's selection of sashimi, nigiri, and sushi rolls. The two Sushi Boat options can serve 2-4 or 4-8 guests, totalling 36 and 72 pieces, respectively. For parties up to 30 guests, Yamashiro offers three prix fixe menu options in the dining room: the two-course Sakura Menu ($49 per guest), the three-course Lotus Menu ($69) and the three-course Orchid Menu for $79. All three menus include soft drinks and iced tea. Parties of 15-30 guests must choose a prix fixe menu. If your party is between 12-14 people and you decline a prix fixe menu, the full dining menu is available for a $45 per-person minimum.